We have 14 hens, but only 13 of them are laying right now. Teddy, our bantam Cochin, is the one that is not laying. She is about 3 years old, and we are keeping her because she is a great pet chicken. She also broods eggs and raises chicks well. Three of the hens lay green eggs, and ten lay brown eggs. I sewed a pillow with lavender in it today. It turned out perfect. It was my first sewing project. I stuffed it with sheep's wool and added dried lavender. We butchered our goats last week. We picked them up yesterday. We had 107 pounds of goat meat. My mom kept the fat to render it and make soap and lotions and creams. I made lots of Lego and this is one of the things I made out of Lego. I made two more. I named them: the one in the picture here is called the Titan Tank. I named another one the Lightning Space Fork. The other one I named the Poison Fang. I built them without instructions--I built them myself with no help. Today it snowed so much, and also last night it must have been really windy, because our tarp on our straw blew off and made our straw all wet and it had a whole bunch of snow on it. The next morning, we couldn't find the tarp, because it was covered under the snow. There was so much snow that I could make a small snow fort. It was still snowing the next morning for pretty much the whole morning, and then it stopped, and the goats and the chickens didn't come out until it stopped snowing. Then they came out. The chickens that were hatched in the spring never really have seen snow. Also, ten pullets are laying. Yesterday we got a dozen eggs. Our buck, Siabonga, is a very nice buck. And also, our cat, Cali, will not go into the goat house because of Siabonga because she's scared of him, so we have to feed her outside where he doesn't come. 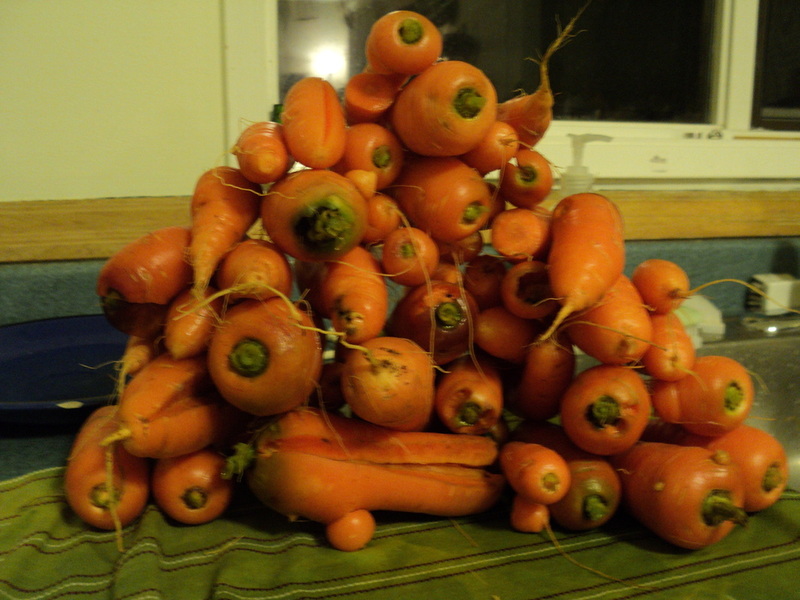 I made a giant stack of carrots today. They were the carrots my mom harvested from the garden. She put straw over them so they wouldn’t freeze. The first time I tried, it tumbled over. The second time I tried, it tumbled over. The third time I tried, it tumbled over. The fourth time I tried it, it tumbled over. The fifth time I tried it, I put the last carrot on and it tumbled over. The sixth time, it worked. Then it tumbled over. We were going to get our first buck, out at another farm. His name is Siabonga. The farm had lots of chickens and lots of goats, and they were selling the buck there. We bought it. But we couldn’t get it right away, because we didn’t have a truck. So we had to get him the next day, because the people had a pickup truck. We didn’t want to put the buck in our car, because bucks really stink because they pee on themselves. They think it smells nice. Female goats also like it. But to us, it stinks. When we got Siabonga home, all the does were scared of him. It was also very dark, because he came late. One of our chickens, Sunny, got eaten by a fox. The fox dug under the fence and got our chicken Sunny. Now we have lots of electric wire to keep the fox out, and there is 8000 volts in it. Last night it snowed, but it's pretty much melted now. I made a small snowman, but it was very small. Our goats and our cat did not like the snow, and our dog got very cold. The chickens did not mind the snow, and they liked eating it. 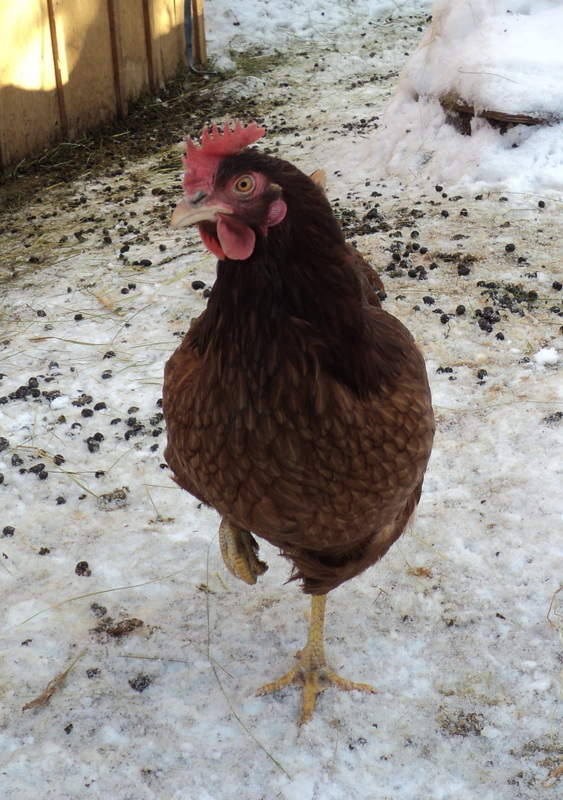 When I smash up ice, it sometimes goes into the chicken coop, and they like eating it. What did the Spanish farmer say to his hens?